Note: For male specimens, see Trichomonas Vaginalis RNA, Qualitative TMA, Males (test code 90801). This test was performed using the Aptima® Trichomonas vaginalis Assay (GEN-PROBE®). 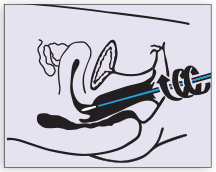 Insert collection swab (blue shaft swab with green printing) into endocervical canal. Gently rotate swab clockwise for 10 to 30 seconds to ensure adequate sampling. 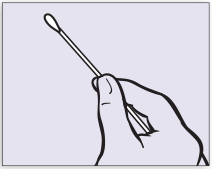 Withdraw swab carefully; avoid any contact with vaginal mucosa. While holding swab in hand, unscrew the tube cap. Do not spill tube contents. If the tube contents are spilled, discard and get a new APTIMA Unisex swab transport tube. 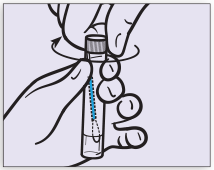 Immediately place swab into transport tube so that the tip of the swab is visible below tube label. 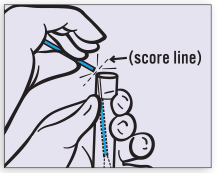 Carefully break swabs shaft at the score line against the side of the tube. Discard top portion of swab shaft. Re-cap swab specimen transport tube tightly.